I’m guessing you at least caught a glimpse of the picture. Granted, it came out around the time LeBron James signed with the Lakers, so your timeline may have been otherwise occupied. The Redshirt Senior: Ivy League Basketball Preview This college basketball season has certainly provided a fair share of excitement. The Dartmouth ski team racked up a laundry list of accolades last season. Men’s alpine skier of the year? After breakout 2017-18 seasons, forward Isalys Quinones ’19 and point guard Cy Lippold ’19 have returned to the court in a similarly dominant fashion. The Dartmouth men’s hockey team has proven multiple times throughout the first half of this season that it can compete with any team in the country. The men’s hockey team entered the 30th annual Ledyard Classic tournament looking to start the second half of the season on the right note after finishing the first half of the 2018-19 season with three straight losses. Football Beats Harvard University for First Time in 15 Years In front of a formidable crowd of students and alumni, the Big Green beat Harvard 24-17 during homecoming for their first win against the Crimson in 15 years and their first at home since 1993. Sticking to Sports: The Four Nations and the state of U.S. women’s hockey Heading into the 2017 International Ice Hockey Federation Women’s World Championship, an event hosted by the United States in Plymouth, Michigan, the future of U.S.
Griffith’s Got Stats: What was up on Nov. 6? The first five days of college basketball season came and went, and now everyone’s talking about that one team from Durham, North Carolina. Nov.
Jennifer Costa ’21 left Connecticut a hero on Saturday night, netting the game-winning goal against Quinnipiac University with just over one minute remaining in overtime. It was a tough weekend for the College. 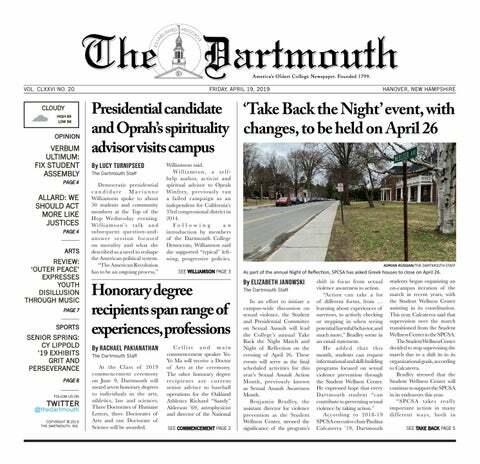 While the Dartmouth College football team fell 9-14 in a defensive struggle against the Princeton University Tigers, a more serious situation occurred on the Dartmouth campus Friday night and I would be remiss if I did not mention the incident. I don’t want to write this column. I’d rather write about LSU-Bama from Baton Rouge, reflect on the Red Sox’s fourth title in my lifetime or break down another week of Connor McDavid showing his otherworldly speed and skill against the best hockey players in the world. The women’s swimming and diving team is off to a great start, recording their first win against the University of New Hampshire on Friday and looking to finish higher than last year’s eighth place performance at the Ivy League Championships.